I'm normally good about bringing homemade treats to parties, but lately I have not been in the mood. I've been keeping meals simple and quick. 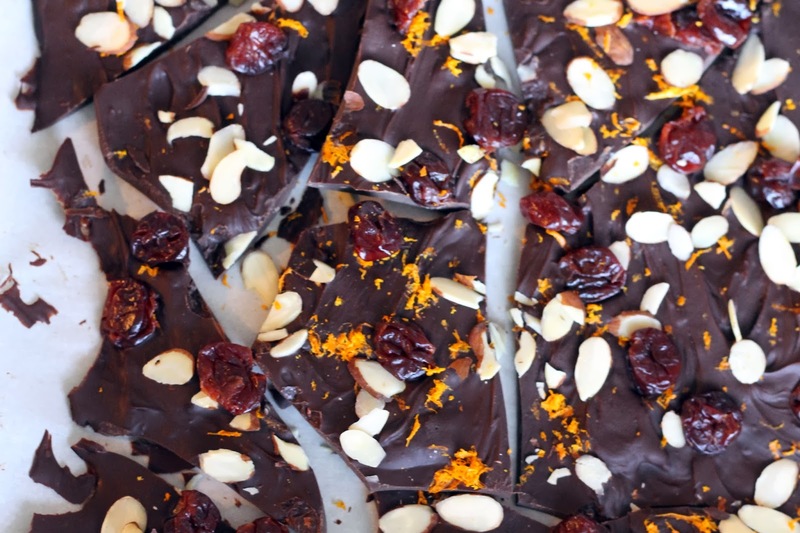 So when I need to bring a dessert to a party this weekend I took the easiest route possible: chocolate bark. Essentially, it is chocolate topped with fruit and nuts, and it is delicious. So, if you're stuck in a rut like me. Try this simple recipe to get back in the kitchen. Line a rimmed baking sheet with parchment paper. Combine chocolates in a large microwavable bowl. Melt the chocolate in the microwave for 30 second intervals, stirring to enhance melting. Once completely melted add vanilla and juice from half the orange. 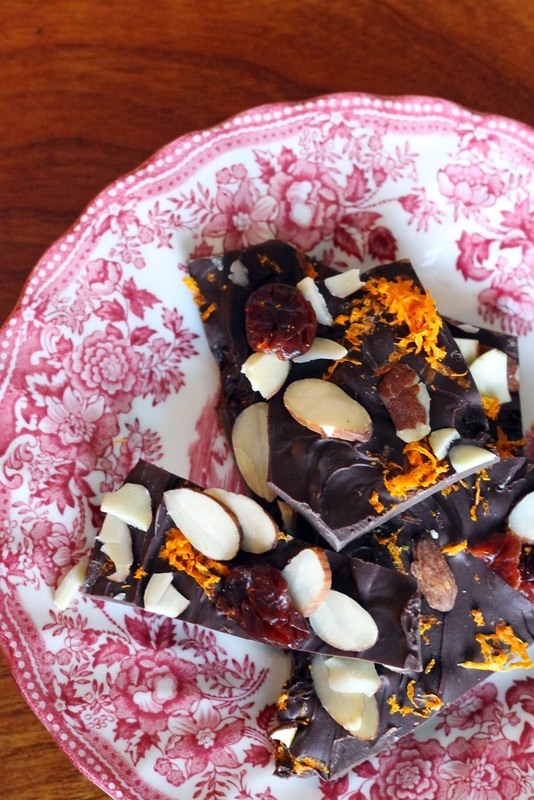 Pour melted chocolate onto parchment paper. Do not worry about it being completely smooth, you want it to be al little rustic. 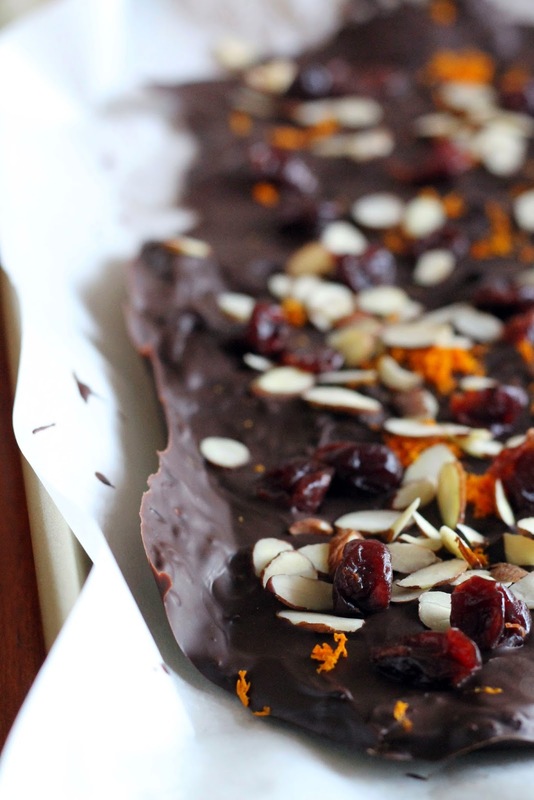 Sprinkle the chocolate with almonds, dried cherries, and the zest of 1 orange. Place the bark in the fridge and allow to cool for 2 hours. Then, break the bark into pieces with your hands. Store in an airtight container in the refrigerator. This looks great! Totally loving the orange zest. Have you tried coconut? 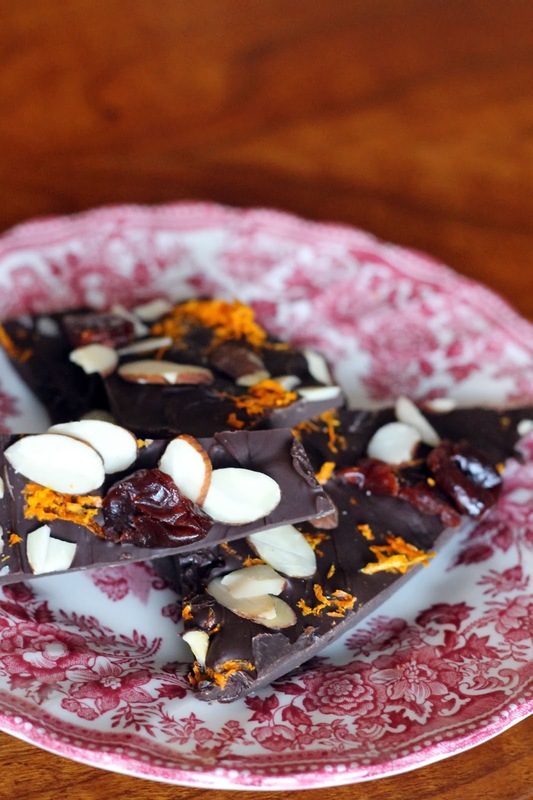 I used it last time I made chocolate bark and it was great! Did flake off a bit though, so I'd definitely pat it down before you stick it in the fridge. Thanks Monica! I will have to try coconut flakes next time, it sounds delicious!